These days I seem to be encountering a lot of restaurants that are in what were formerly Chinese takeout joints, which all have unifying characteristics that give them away immediately. In the case of La Espiguita, under the N and W train in Astoria, it is the low-quality photos of Mexican standards on the wall that have replaced what used to be lo mein and pork fried rice. The kitchen is open to the restaurant, and you really want them to be preparing your food in woks just to further the impression. On the far wall, a refrigerator full of Jarritos sodas next to rods of simmering roasted chickens serve as visual delights, but all eyes in the place are focused above this to the flatscreen television that is pumping trashy game shows. 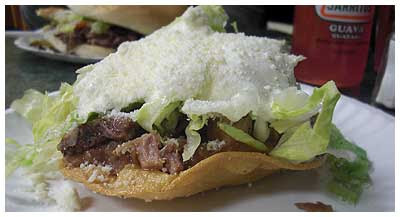 Prices are similar to similar Mexican eateries around the city, but the portions here seem to be super-sized. 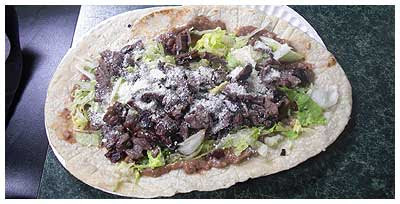 I ordered the huarache ($5, above) and was amazed by the giant oval "sandal" that I was greeted with, piled high with cecina, lettuce, cream, and grated cheese, all over a thin base of beans that was applied over the tortilla rather than within it. A man at the table next to ours had eventually picked portions of his up, folded them over like a slice of pizza, and eaten it this way, so I followed suit once I had some of the ingredients on top eaten and more manageable. The torta ($5, below) is always a simple, working-class sandwich, and is no different here than usual, a dish that concentrates on a heap of meat, in this case the bistek. It like the huarache was more than enough for a meal, and was best slathered in the house green salsa. Completely unnecessary, but delicious nonetheless, was our tostada ($2, below), also a mountain of ingredients on the small deep fried tortilla. I am always prone to ordering this item which was created in the past when tortillas went stale, but now is a staple and desired even when fresh ones abound. The meat selection for this one was carnitas, by far the pick of the meats on this evening, a juicy selection of simmered pork bits. While I certainly won't be grouping Astoria in the ranks of Sunset Park or Corona for Mexican food destinations, it was a pleasant surprise to find in a very eater-friendly neighborhood.